The Viacom group of networks relied on Pete’s Big TVs to kick off the spring 2016 Television Upfront season in NYC. Hosting two days of presentations about their slate of new and returning shows, for the first time, Viacom hosted two separate upfronts in two different locations over two days. Both presentations’ production designs reflected the creative energy of the Viacom networks and helped underscore the overall brand while presenting each channel's unique identity. Pete’s Big TVs (PBTV) worked closely with the producers and the creative teams to realize the dynamic visual designs for each presentation. 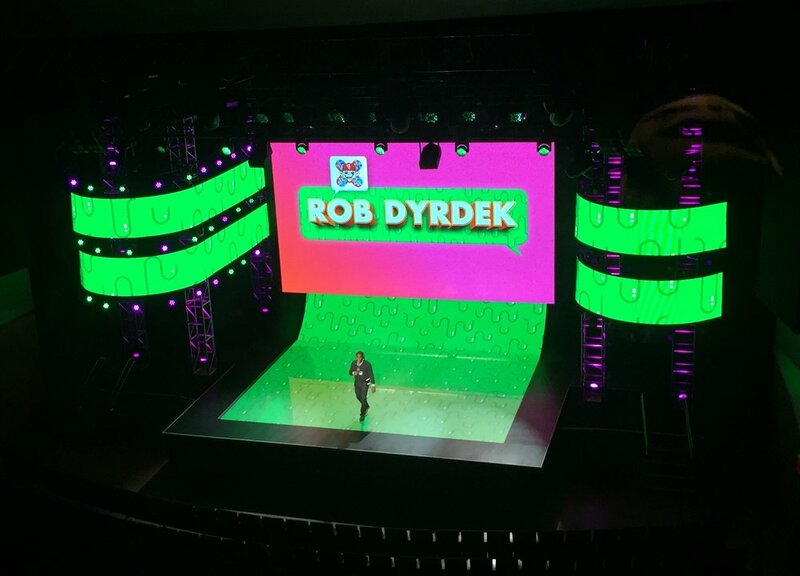 Nickelodeon upfront video design also included a center hero screen of digiLED CS5 tiles and ribbon screens of Gtek Flexible Display LED panels with a 15mm pixel pitch that curved around the sides of the stage, completing the dynamic and enveloping video design. Being able to supply the latest video technology solutions, offer design versatility and setup flexibility are a large part of why Viacom trusted their upfronts to PBTV. Under tight timeframes, PBTV was able to provide the needed equipment without compromise and the experienced crew necessary to meet the demands of two complete productions at two different venues several city blocks apart.